When you think of Germany, you think of beer... yes? German beer might be good, but it is not as great as some of the Riesling wines created along the Mosel River. For a wine lover like me, there is nothing more exciting than a visit to a top wine-producing area seeing and tasting, first hand, how high quality wines are created. 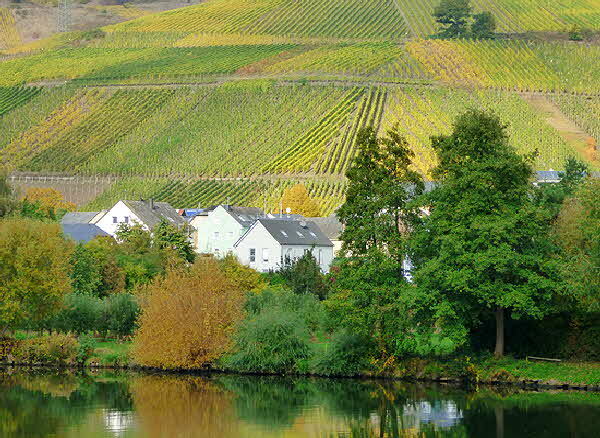 Our Uniworld Rhine River Cruiser (see River Queen) took us along the Mosel River valley, from Koblenz to Trier, where hectares of Riesling grapevines cling precariously to the steep hillsides by the river banks. Here can be found a number of Germany’s most famous vineyards. Some of the best known Mosel vineyards are: the Bernkasteler Doctor, the Bernkasteler Ley, the Treis-Karden Juffermauer, the Wehlener Sonnenuhr, Brauneberg Juffer-Sonnenuhr, and Zeltinger Sonnenuhr. 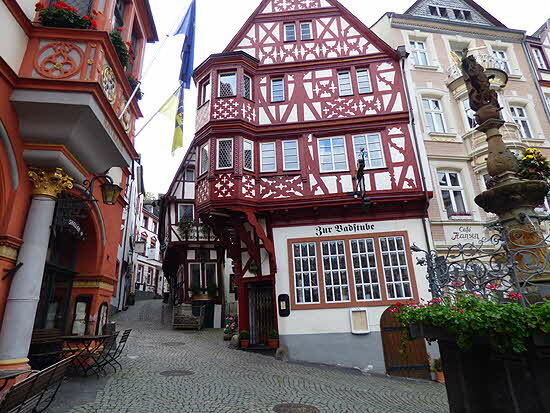 The vidicultural center of the region is the city of Bernkastel-Kues. This is the Riesling wine area par excellence. Because the Bernkastel name is so internationally famous, the name Badstube is also still in use for wines produced in a large number of plots from around the Bereich(German viticultural region) of Bernkastel, that are not necessarily closely related to -- or even located near -- the town of Bernkastel. The Romans introduced grape-growing and winemaking to the region when they colonized what is now the city of Trier, and there has been major winemaking in this area since the middle ages. There are still a few horizondal vine terraces on the hillsides built originally by the Romans, but the majority of the Riesling vineyards are now planted in vertical rows, on slopes that vary in grade from 45 to 60 degrees. They are planted, cultivated and harvested by hand as the topography is such that that no mechanization can occur. Most of the vines are ungrafted. The Grand Cru vineyard is the “Doctor am Doctorberg”�. Wines from the “Doctor” are in every important wine list, both in Germany and abroad. 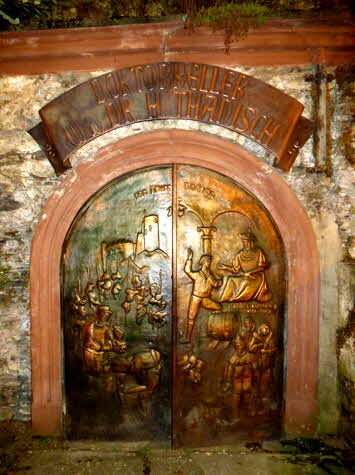 The name Doctor, as legend would have it, originated in the fourteenth century when the ailing Elector of Trier, Archbishop Bohemund II, revived miraculously after drinking on his sick bed wine from this vineyard. During most of the 19th century, the Doctor vineyard was leased to one family and it eventually became the property of Dr. Hugo Thanisch and his wife Katharina; their descendants still own sizable vine tracts in the area, but the vineyard is currently divided into plots owned by very few other estates. The soil of the vineyard is decomposed blue slate and/or kaolin-slate. The vineyard is planted exclusively with Riesling vines, about 45% of which are ungrafted, on their own rootstock. Many of the Doctor grapevines are over 100 years old, producing very low yields; the wines are full of power and each is an incredible fruity and aromatic masterpiece with a long delicate finish. On this trip I visited with Barbara Rundquist and her husband Eric. In addition to numerous plots of some of the best local vineyards they own, they have 1 hectare of the Doctor that belongs to the original Thanisch estate and produces exceptional wines branded “Weingut Wwe Dr. H. Thanisch, Erben M�ller-Burggraef”��. The wines are imported in the US by Winesellers Ltd. of Chicago. One of the reasons I visited the estate is because a brand new, state of the art, winery using stainless steel has been build to gently press and ferment the wines. But, the old oak barrels and foudres in the ancient cellar under the Doctor vineyard are still in use to age these incredible wines. Pickers make several passes through the vineyard, as the grapes ripen. The grapes are pressed immediately on arrival at the winery in order to retain the freshness and aroma so characteristic of Mosel’s Rieslings. Kabinett (meaning that the wine is of Reserve quality; the driest diner-style wine). Sp�tlese (late harvest; meaning that the grapes were harvested at high ripeness -- it does not necessarily mean that it is a sweet “dessert” wine as a late harvest indication would mean in the US). Auslese (select harvest; made from very ripe, hand selected bunches, typically semi-sweet or sweet, sometimes exhibiting botrytis i.e. noble rot). Beerenauslese (made from overripe grapes individually selected from bunches affected by botrytis; it is a rich, sweet dessert wine). Trockenbeerenauslese (made from select overripe shriveled, raisin like grapes, often affected by noble rot making extremely rich sweet wines. "Trocken" in this phrase refers to the grapes being dried on the vine rather than that the resulting wine is dry). Eiswein (ice wine). Made from very ripe grapes that have been naturally frozen on the vine when the vineyard temperature goes under -7� C as required by German law. The most classic Eiswein-style made is to use only grapes that are not affected by botrytis. At the tasting I had a chance to sample examples of the 2014 and 2015 vintages. 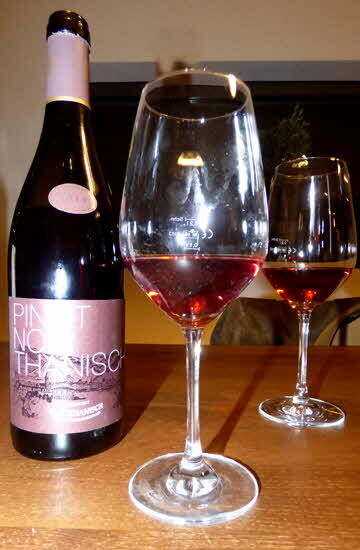 I also had a chance to try the only Thanisch red wine, a 2014 Pinot Noir produced in the Mosel region. It is a low alcohol (12% ABV), nicely dry wine that is available at only a few outlets in Europe. Merchants are listing the 2012, 2013, and 2014 vintages. 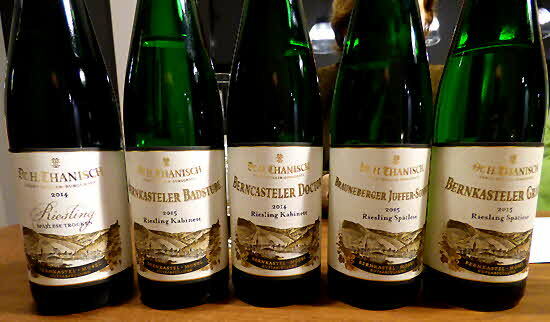 But my main interest were the white Riesling wines that are the most famous of the Thanisch product; the wines of Badstube, Graben, Lay and especially the Doctor vineyards. Thanisch is rightly regarded as one of the top producers in the Mosel, and the wines certainly show an estate at the top of its game. The Bernkasteler Doctor samples showed honey, pure fruit and nice acidity that delighted my palate. The gorgeous fruit is marked by complex notes in the palate of ripe peaches, apricots, honey and mandarin oranges. Lovely aromas of peach, pear and nectarine are enhanced by tropical hints of ginger and lychee. And the Auslese Rieslings from Bernkasteler Ley and the Bernkasteler Doctor though sweet and aromatic somehow -- thanks to the bracing acidity -- managed to pair beautifully with a Wellington of Veal Tenderloin one evening, a Wiener Schnitzel another, and a Homemade Cannelloni Bolognese a third that the kitchen at the “River Queen”��, our Rhine River Cruiser, prepared for our table. It is interesting to note how different the palate is of the wines produced from grapes in blue/gray slate vineyards compared to red slate vineyards. While the blue slate create the most classic, beautifully balanced honeyed wines, with fresh acidity, vibrant minerality and none of the sticky sweetness too often associated with lower quality Riesling, the red slate exhibits intensely ripe stone fruit flavors and a stony minerality that is quite enchanting. One can really see the difference when tasting a Spätlese from the Doctor vineyard (blue slate) vs. a Sp�tlese from the Braunberger Juffer Sonnenhur (red slate). Legendary Rhine & Moselle River Cruise and River Queen.